Our story kicks off from where we left it last issue, He-Man, Teela, Queen Marlena and Evil-Lynn stand fighting alongside John Constantine fighting shadow like rat creatures created from magic. Constantine fails to control the situation, but is assisted by Evil-Lynn, who is familiar with such magic and they manage to eliminate the threat. He-man has a quick moment with his mother who we learned from last issue had been missing from Eternia for quite some time. Queen Marlena quickly catches up her son and the rest of the crew of her origin story, being an Earth astronaut, who somehow crossed a dimensional barrier and ended up on the planet Eternia, where she eventually married King Randor (He-Man's father). Meanwhile at that very moment, Skeletor has managed to infiltrate the JL satellite base, through the help of Earth's magic that he has managed to tap into and use as his own. He is confronted by the Justice League, where Superman takes point and is the first to engage the evil despot of Eternia. Skeletor tells Superman that he knows all about him, and also knows that one of his 2 major weaknesses is magic. The League watches Superman get taken down by him, but don't have enough time to react, as Skeletor unleashes his "scare-glows" to attack the rest of the team. Batman seeing that they are clearly out matched, opens a boom tube transport to retreat to the Batcave. Meanwhile on Eternia, Man-At-Arms, Mossman, Stratos and Roboto stand at the site where He-Man and Teela were transported by Evil-Lynn to Earth, and try to come up with a plan to go after them to rescue them and bring them back. Back on Earth, He-Man and his companions have found their way to the Batcave with help and directions from John Constantine. Teela feels uneasy as she sees the different Robin costumes on display in the cave. At that moment, Batman transports in via Boom Tube, fighting one of Skeletor's creatures. He is assisted by He-Man who cuts the creature down, only to be confronted by a startled Batman, who asks how they got into his Batcave. Constantine smugly tells Batman that it was his doing, but before they have a chance to get up to speed, Superman crashes into the cave, followed by the rest of the League. They are clearly possessed and under Skeletor's control. A battle ensues with the possessed League taking on the stranded Eternian residents. He-Man and Superman have an intense battle. He-Man realizes that Superman is more powerful than anything he has ever faced, and to win the fight, he plunges his power Sword into Superman's chest. Superman falls to the ground lifelessly. Shocked by this event, everybody stops fighting, and in the final panel we are left with a shocked Batman saying "What have you done". Story - 5: I absolutely loved the writing this issue. The banter between characters and the set up for the epic battle yet to come in future issues, really left me wanting to read out the rest of this series! I was a little harsh in my review last month. I felt that it could have been better, but I am so glad that things picked up so quickly. I have quite a few favorite moments this issue, the fight between Superman and He-Man is definitely at the top my list, along with the superb dialogue by Keith Giffen. But the overall set up to how this series will play out really did it for me. The scene where Teela looks at the different Robin costumes in the Batcave and saying, "We should get out of here, I think he kills kids," made me literally laugh out loud! This and when Skeletor calls Wonder Woman "Woman of Wonders" where the 2 best lines of dialogue in this issue! Queen Marlena's attitude toward Teela was also a great touch "Nice to see you too Teela," was another great touch. It gave the sense that these characters do live together in their respected universe and don't necessarily get along! 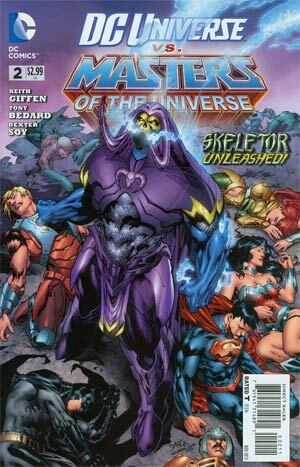 Skeletor taking the Justice League to task was another great plot point. It is a great reminder that the League may be powerhouses but against a credible threat, they too can struggle... And even be taken over! I did find that Batman being the one that gets away and eventually a bit clich�... I mean does Batman really always have to be the guy with the plan, and rescue the actual Super Powered heroes all the time?... Then again, the story needed to be relocated to the Batcave, so I guess I can live with that. The Batarang to Constantine's hand swiping the cigarette away followed by the "Do you see an ashtray" line was a very cool touch! You don't tug on Superman's cape and you don't smoke in the Batcave. Though I feel Superman could have put up more of a fight against Skeletor, and even though he appears to have been slain at the hands of He-Man, and we know he will be back I hope he really gets a Kick @$$ moment in the issues to come! Art - 3: Last issue, I was very hard on Dexter Soy and the art for the book. I still feel that he may need a separate inker and colorist, but I found the art a lot better than last issue. There is an absolute beautiful shot of Superman standing behind He-Man on page 16. The use of shadows and coloring is perfect... Even with the coloring error, where it appears that Superman's New 52 suit does not have a collar (actually, I liked that bit a lot). While we are on the subject of Superman, I do feel Dexter Soy treated our boy in blue with respect. Almost all the Superman shots looked fantastic. In fact his entire rendition of the Justice League looked great. It reminded me of the recent Justice League: Flashpoint Paradox animated film. Similar style in character designs I guess. Dexter Soy's rendition of the Batcave along with my two most favorite Batmobile's really made me happy. I feel that he definitely stepped up his game from the last issue. The last two pages really captured the emotion and suspense of the cliff-hanger ending. He Man's power sword plunged into Superman's chest and the look on Batman's face on the last panel... This looked great, and left me wanting more! Well done Mr Giffen and Mr Soy! Cover Art - 5: The cover is done by the infamous Ed Benes yet again this issue. Just the same as last issue, it is a great composition. Though what is depicted on the cover does not necessarily happen this issue it does capture the essence of where the story is ultimately headed. Story - 4: If you had told me that this issue would end with He-Man killing Superman...well, I would have believed you because this is modern DC Comics we're talking about but at least I would have thought, "Well how does that work?" So far this crossover is hitting all of the right notes. The fact that the Justice League was being mind-controlled wasn't terribly surprising though it is a good way to get the good guys to fight the other good guys. You have three basic choices when it comes to that sort of thing. Option A, the heroes meet and there is a misunderstanding and a fight breaks out. Option B, one group of heroes is tricked/forced to fight the other heroes due to the machinations of the villain. Option C, which is what we got in this book, one group of heroes is being mind-controlled into fighting the other team. I wasn't expecting this book to break new ground in terms of this sort of team-up so the fact that that end of the story was handled as well as it did satisfied me as a reader and I pretty much saw that sort of thing coming. What I didn't see coming was how good the set-up to that fight would be. We got a satisfactory conclusion to the battle at Constantine's and some fun dialogue between John and Evil-Lynn. Even though I haven't read any of the current Masters of the Universe comic DC has been publishing I was touched by the reunion of He-Man and his mother. He-Man's mother being from Earth was an aspect of the original cartoon series continuity that I always liked so it is nice to see it carried over into this version of the legend with a heaping dose of modernizing to go with it. This leads into Skeletor's first confrontation with the Justice League and I will admit that despite liking the scene I was a bit disappointed that the writers fell into the trap of making the villain look all big and bad by taking Superman down first. It's an old trick and to be honest it is effective but I thought it was too much right out of the gate. It did lead to Batman running off to the Batcave where my favorite moment of the issue happened. Upon seeing the rows of Robin suits Batman has in the cave Teela wants to leave because she thinks Batman kills kids. I wasn't expecting such a joke when it happened but it turned out to be a pleasant surprise. The fight that started in the Batcave and ended (as far as the issue goes at any rate) on the grounds of Wayne Manor was well paced but I had to face the fact that the fight I was looking forward to the most was Superman vs. He-Man. Here are two heroes of my childhood facing off for the first time now that I am an adult. I knew it was going to be big and loud but the writers made good use of the mind control element to make Superman bloodthirsty and savage. The fact that He-Man had to put him down in the way he did made for both a shocking end to the issue but also a good character moment for He-Man who didn't want to kill Superman but felt there was no other choice. In the end this was a very satisfying issue. I was entertained from start to finish and the story is taking some interesting directions. The writers are doing a great job of playing with both worlds and making sure each one has a time to shine. Art - 4: Overall the art in this issue was solid and satisfactory. All of the main characters looked on model and the action was fantastic. My only real complaint was how Batman looked during the scene in the Batcave. He was a bit off and appeared...more cartoony than the art really allowed for especially when he knocks the lighter out of John's hand. Other than that I was very pleased with how the book looked especially the fight between Superman and He-Man. Cover Art - 4: This is a great cover. Simple. To the point. Skeletor looks good and it gets the message across. Some would say it is by the book but I think this is the sort of cover you would expect from a crossover like this.